Our Fourth Grade Reading List!! – Happy. Homeschooling. Housewife. Our Fourth Grade Reading List!! It is that time of year that I focus on the next school year. After many, many months of going through book selections, I have finally finalized Princess Bella’s 4th grade reading list. 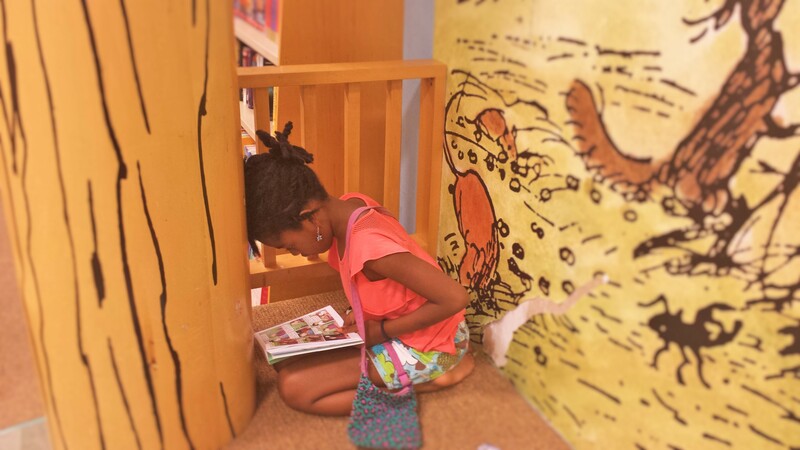 Princess Bella snuggled in the corner in what has to be the best spot in Barnes and Nobles. I so enjoy selecting books for her because she, like her momma, is a book lover! Here are the books we will be exploring during 4th grade. Mma lives and works in Johannesburg, far from the village thirteen-year-old Naledi and her younger brother, Tiro, call home. When their baby sister suddenly becomes very sick, Naledi and Tiro know, deep down, that only one person can save her. Bravely, alone, they set off on a journey to find Mma and bring her back. It isn’t until they reach the city that they come to understand the dangers of their country, and the painful struggle for freedom and dignity that is taking place all around them. In this Newbery Medal-winning book set in 12th century Korea, Tree-ear, a 13-year-old orphan, lives under a bridge in Ch’ulp’o, a potters’ village famed for delicate celadon ware. He has become fascinated with the potter’s craft; he wants nothing more than to watch master potter Min at work, and he dreams of making a pot of his own someday. When Min takes Tree-ear on as his helper, Tree-ear is elated — until he finds obstacles in his path: the backbreaking labor of digging and hauling clay, Min’s irascible temper, and his own ignorance. But Tree-ear is determined to prove himself — even if it means taking a long, solitary journey on foot to present Min’s work in the hope of a royal commission . . . even if it means arriving at the royal court with nothing to show but a single celadon shard. “There is a disease that can twist men’s hearts and make them mad, and the name of that disease is jealousy.” So begins this engaging retelling of one of William Shakespeare’s last plays—a fascinating and unique combination of intensity and whimsy. When King Leontes unfairly accuses his wife of infidelity, he sets off a terrible chain of events. But this is not one of Shakespeare’s tragedies. It’s a romance, and one with a healthy dose of fancy and surprise. A story of redemption and the strength of friendship and true love, The Winter’s Tale is perhaps also Bruce Coville’s most eloquent retelling yet, complemented masterfully by illustrator LeUyen Pham, whose rich and dramatic paintings are a revelation. A beautiful paperback edition of The Magician’s Nephew, book three in the classic fantasy series, The Chronicles of Narnia, featuring cover art by three time Caldecott Medal-winning illustrator, David Wiesner, and black-and-white illustrations by the series’ original illustrator, Pauline Baynes. Witness the creation of a magical land in The Magician’s Nephew, the first title in C. S. Lewis’s classic fantasy series, which has captivated readers of all ages for over sixty years. This is a stand-alone novel, but if you want to journey back to Narnia, read The Lion, the Witch and the Wardrobe, the second book in The Chronicles of Narnia. Stay Encouraged, Be Blessed & Happy Reading! Previous Are you a secret homeschooler?!!!! Next Dear Channie: What is Your Home School Schedule?